Once the most celebrated intellectual, Jean-Paul Sartre had, until quite recently, almost faded from view. He was already being attacked for his ‘blindness’ about the Soviet gulags shortly after his death in 1980, and even his humanist Existentialism was ridiculed for its optimism, voluntarism and sheer energetic reach. Sartre’s whole career was offensive both to the so-called Nouveaux Philosophes, whose mediocre attainments had only a fervid anti-Communism to attract any attention, and to the post-structuralists and Post-Modernists who, with few exceptions, had lapsed into a sullen technological narcissism deeply at odds with Sartre’s populism and his heroic public politics. The immense sprawl of Sartre’s work as novelist, essayist, playwright, biographer, philosopher, political intellectual, engaged activist, seemed to repel more people than it attracted. From being the most quoted of the French maîtres penseurs, he became, in the space of about twenty years, the least read and the least analysed. His courageous positions on Algeria and Vietnam were forgotten. So were his work on behalf of the oppressed, his gutsy appearance as a Maoist radical during the 1968 student demonstrations in Paris, as well as his extraordinary range and literary distinction (for which he both won, and rejected, the Nobel Prize for Literature). He had become a maligned ex-celebrity, except in the Anglo-American world, where he had never been taken seriously as a philosopher and was always read somewhat condescendingly as a quaint occasional novelist and memoirist, insufficiently anti-Communist, not quite as chic and compelling as (the far less talented) Camus. There is one obvious exception, which I’d like to describe here. I’m prompted to do so by two fascinating, if dispiriting discussions of his visit to Egypt in early 1967 that appeared last month in Al-Ahram Weekly. One was in a review of Bernard-Henry Lévy’s recent book on Sartre; the other was a review of the late Lotfi al-Kholi’s account of that visit (al-Kholi, a leading intellectual, was one of Sartre’s Egyptian hosts). My own rather forlorn experience with Sartre was a very minor episode in a very grand life, but it is worth recalling both for its ironies and for its poignancy. It was early in January 1979, and I was at home in New York preparing for one of my classes. The doorbell announced the delivery of a telegram and as I tore it open I noticed with interest that it was from Paris. ‘You are invited by Les Temps modernes to attend a seminar on peace in the Middle East in Paris on 13 and 14 March this year. Please respond. 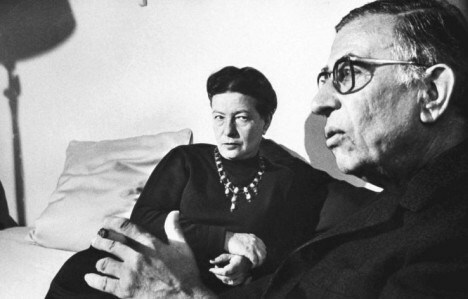 Simone de Beauvoir and Jean Paul Sartre.’ At first I thought the cable was a joke of some sort. It might just as well have been an invitation from Cosima and Richard Wagner to come to Bayreuth, or from T.S. Eliot and Virginia Woolf to spend an afternoon at the offices of the Dial. It took me about two days to ascertain from various friends in New York and Paris that it was indeed genuine, and far less time than that to despatch my unconditional acceptance (this after learning that les modalités, the French euphemism for travel expenses, were to be borne by Les Temps modernes, the monthly journal established by Sartre after the war). A few weeks later I was off to Paris. Les Temps modernes had played an extraordinary role in French, and later European and even Third World, intellectual life. Sartre had gathered around him a remarkable set of minds – not all of them in agreement with him – that included Beauvoir of course, his great opposite Raymond Aron, the eminent philosopher and Ecole Normale classmate Maurice Merleau-Ponty (who left the journal a few years later), and Michel Leiris, ethnographer, Africanist and bullfight theoretician. There wasn’t a major issue that Sartre and his circle didn’t take on, including the 1967 Arab-Israeli war, which resulted in a monumentally large edition of Les Temps modernes – in turn the subject of a brilliant essay by I.F. Stone. That alone gave my Paris trip a precedent of note. When I arrived, I found a short, mysterious letter from Sartre and Beauvoir waiting for me at the hotel I had booked in the Latin Quarter. ‘For security reasons,’ the message ran, ‘the meetings will be held at the home of Michel Foucault.’ I was duly provided with an address, and at ten the next morning I arrived at Foucault’s apartment to find a number of people – but not Sartre – already milling around. No one was ever to explain the mysterious ‘security reasons’ that had forced a change in venue, though as a result a conspiratorial air hung over our proceedings. Beauvoir was already there in her famous turban, lecturing anyone who would listen about her forthcoming trip to Teheran with Kate Millett, where they were planning to demonstrate against the chador; the whole idea struck me as patronising and silly, and although I was eager to hear what Beauvoir had to say, I also realised that she was quite vain and quite beyond arguing with at that moment. Besides, she left an hour or so later (just before Sartre’s arrival) and was never seen again. Foucault very quickly made it clear to me that he had nothing to contribute to the seminar and would be leaving directly for his daily bout of research at the Bibliothèque Nationale. I was pleased to see my book Beginnings on his bookshelves, which were brimming with a neatly arranged mass of materials, including papers and journals. Although we chatted together amiably it wasn’t until much later (in fact almost a decade after his death in 1984) that I got some idea why he had been so unwilling to say anything to me about Middle Eastern politics. In their biographies, both Didier Eribon and James Miller reveal that in 1967 he had been teaching in Tunisia and had left the country in some haste, shortly after the June War. Foucault had said at the time that the reason he left had been his horror at the ‘anti-semitic’ anti-Israel riots of the time, common in every Arab city after the great Arab defeat. A Tunisian colleague of his in the University of Tunis philosophy department told me a different story in the early 1990s: Foucault, she said, had been deported because of his homosexual activities with young students. I still have no idea which version is correct. At the time of the Paris seminar, he told me he had just returned from a sojourn in Iran as a special envoy of Corriere della sera. ‘Very exciting, very strange, crazy,’ I recall him saying about those early days of the Islamic Revolution. I think (perhaps mistakenly) I heard him say that in Teheran he had disguised himself in a wig, although a short while after his articles appeared, he rapidly distanced himself from all things Iranian. Finally, in the late 1980s, I was told by Gilles Deleuze that he and Foucault, once the closest of friends, had fallen out over the question of Palestine, Foucault expressing support for Israel, Deleuze for the Palestinians. Foucault’s apartment, though large and obviously extremely comfortable, was starkly white and austere, well suited to the solitary philosopher and rigorous thinker who seemed to inhabit it alone. A few Palestinians and Israeli Jews were there. Among them I recognised only Ibrahim Dakkak, who has since become a good Jerusalem friend, Nafez Nazzal, a teacher at Bir Zeit whom I had known superficially in the US, and Yehoshofat Harkabi, the leading Israeli expert on ‘the Arab mind’, a former chief of Israeli military intelligence, fired by Golda Meir for mistakenly putting the Army on alert. Three years earlier, we had both been fellows at the Stanford Center for Advanced Study in the Behavioral Sciences, but we did not have much of a relationship. It was always polite but far from cordial. In Paris, he was in the process of changing his position, to become Israel’s leading establishment dove, a man who was soon to speak openly about the need for a Palestinian state, which he considered to be a strategic advantage from Israel’s point of view. The other participants were mostly Israeli or French Jews, from the very religious to the very secular, although all were pro-Zionist in one way or another. One of them, Eli Ben Gal, seemed to have a long acquaintance with Sartre: we were later told that he had been Sartre’s guide on a recent trip to Israel. When the great man finally appeared, well past the appointed time, I was shocked at how old and frail he seemed. I recall rather needlessly and idiotically introducing Foucault to him, and I also recall that Sartre was constantly surrounded, supported, prompted by a small retinue of people on whom he was totally dependent. They, in turn, had made him the main business of their lives. One was his adopted daughter who, I later learned, was his literary executor; I was told that she was of Algerian origin. Another was Pierre Victor, a former Maoist and co-publisher with Sartre of the now defunct Gauche prolétarienne, who had become a deeply religious and, I supposed, Orthodox Jew; it stunned me to find out later from one of the journal’s assistants that he was an Egyptian Jew called Benny Lévy, the brother of Adel Ref’at (né Lévy), one of the so-called Mahmoud Hussein pair (the other being a Muslim Egyptian: the two men worked at Unesco and as ‘Mahmoud Hussein’ wrote La Lutte des classes en Egypte, a well-known study published by Maspero). There seemed to be nothing Egyptian about Victor: he came across as a Left Bank intellectual, part-thinker, part-hustler. Third was Hélène von Bülow, a trilingual woman who worked at the journal and translated everything for Sartre. Although he had spent time in Germany and had written not only on Heidegger, but on Faulkner and Dos Passos, Sartre knew neither German nor English. An amiable and elegant woman, Von Bülow remained at Sartre’s side for the two days of the seminar, whispering simultaneous translations into his ear. Except for one Palestinian from Vienna who spoke only Arabic and German, our discussion was in English. How much Sartre actually understood I shall never know, but it was (to me and others) profoundly disconcerting that he remained silent throughout the first day’s proceedings. Michel Contat, Sartre’s bibliographer, was also there, but did not participate. In what I took to be the French style, lunch – which in ordinary circumstances would have taken an hour or so – was a very elaborate affair taken at a restaurant some distance away; and since it had been raining non-stop, transporting everyone in cabs, sitting through a four-course meal, then bringing the group back again, took about three and a half hours. So on the first day our discussions about ‘peace’ lasted for a relatively short time. The themes were set out by Victor without any consultation with anyone else, so far as I could see. Early on, I sensed that he was a law unto himself, thanks no doubt to his privileged relationship with Sartre (with whom he occasionally had whispered exchanges), and to what seemed to be a sublime self-confidence. We were to discuss: (1) the value of the peace treaty between Egypt and Israel (this was Camp David time), (2) peace between Israel and the Arab world generally, and (3) the rather more fundamental question of future coexistence between Israel and the surrounding Arab world. None of the Arabs seemed happy with this. I felt it leapfrogged over the matter of the Palestinians. Dakkak was uneasy with the whole set-up and left after the first day. As that day wore on, I slowly discovered that a good deal of negotiating had gone on beforehand to bring the seminar about, and that what participation there was from the Arab world was compromised, and hence abridged, by all the prior wheeling and dealing. I was somewhat chagrined that I hadn’t been included in any of this. Perhaps I had been too naive – too anxious to come to Paris to meet Sartre, I reflected. There was talk of Emmanuel Levinas being involved, but, like the Egyptian intellectuals whom we’d been promised, he never showed up. In the meantime all our discussions were being recorded and were subsequently published in a special issue of Les Temps modernes (September 1979). I thought it was pretty unsatisfactory. We were covering more or less familiar ground, with no real meeting of minds. Beauvoir had been a serious disappointment, flouncing out of the room in a cloud of opinionated babble about Islam and the veiling of women. At the time I did not regret her absence; later I was convinced she would have livened things up. Sartre’s presence, what there was of it, was strangely passive, unimpressive, affectless. He said absolutely nothing for hours on end. At lunch he sat across from me, looking disconsolate and remaining totally uncommunicative, egg and mayonnaise streaming haplessly down his face. I tried to make conversation with him, but got nowhere. He may have been deaf, but I’m not sure. In any case, he seemed to me like a haunted version of his earlier self, his proverbial ugliness, his pipe and his nondescript clothing hanging about him like so many props on a deserted stage. I was very active in Palestinian politics at the time: in 1977 I had become a member of the National Council, and on my frequent visits to Beirut (this was during the Lebanese civil war) to visit my mother, regularly saw Arafat, and most of the other leaders of the day. I thought it would be a major achievement to coax Sartre into making a pro-Palestinian statement at such a ‘hot’ moment of our deadly rivalry with Israel. Throughout the lunch and the afternoon session I was aware of Pierre Victor as a sort of station-master for the seminar, among whose trains was Sartre himself. In addition to their mysterious whisperings at the table, he and Victor would from time to time get up; Victor would lead the shuffling old man away, speak rapidly at him, get an intermittent nod or two, then they’d come back. Meanwhile every member of the seminar wanted to have his or her say, making it impossible to develop an argument, though it soon enough became clear that Israel’s enhancement (what today is called ‘normalisation’) was the real subject of the meeting, not the Arabs or the Palestinians. Several Arabs before me had spent time trying to convince some immensely important intellectual of the justice of their cause in the hope that he would turn into another Arnold Toynbee or Sean McBride. Few of these great eminences did. Sartre struck me as worth the effort simply because I could not forget his position on Algeria, which as a Frenchman must have been harder to hold than a position critical of Israel. I was wrong of course. As the turgid and unrewarding discussions wore on, I found that I was too often reminding myself that I had come to France to listen to what Sartre had to say, not to people whose opinions I already knew and didn’t find specially gripping. I therefore brazenly interrupted the discussion early in the evening and insisted that we hear from Sartre forthwith. This caused consternation in the retinue. The seminar was adjourned while urgent consultations between them were held. I found the whole thing comic and pathetic at the same time, especially since Sartre himself had no apparent part in these deliberations. At last we were summoned back to the table by the visibly irritated Pierre Victor, who announced with the portentousness of a Roman senator: ‘Demain Sartre parlera.’ And so we retired in keen anticipation of the following morning’s proceedings. Sure enough Sartre did have something for us: a prepared text of about two typed pages that – I write entirely on the basis of a twenty-year-old memory of the moment – praised the courage of Anwar Sadat in the most banal platitudes imaginable. I cannot recall that many words were said about the Palestinians, or about territory, or about the tragic past. Certainly no reference was made to Israeli settler-colonialism, similar in many ways to French practice in Algeria. It was about as informative as a Reuters dispatch, obviously written by the egregious Victor to get Sartre, whom he seemed completely to command, off the hook. I was quite shattered to discover that this intellectual hero had succumbed in his later years to such a reactionary mentor, and that on the subject of Palestine the former warrior on behalf of the oppressed had nothing to offer beyond the most conventional, journalistic praise for an already well-celebrated Egyptian leader. For the rest of that day Sartre resumed his silence, and the proceedings continued as before. I recalled an apocryphal story in which twenty years earlier Sartre had travelled to Rome to meet Fanon (then dying of leukemia) and harangued him about the dramas of Algeria for (it was claimed) 16 non-stop hours, until Simone made him desist. Gone for ever was that Sartre. When the transcript of the seminar was published a few months later, Sartre’s intervention had been edited down and made even more innocuous. I cannot imagine why; nor did I try to find out. Even though I still have the issue of Les Temps modernesin which we all appeared, I haven’t been able to bring myself to reread more than a few extracts, so flat and unrewarding do its pages now seem to me. So I went to Paris to hear Sartre in much the same spirit as Sartre was invited to come to Egypt, to be seen and talked to by Arab intellectuals – with exactly the same results, though my own encounter was coloured, not to say stained, by the presence of an unattractive intermediary, Pierre Victor, who has since disappeared into well deserved obscurity. I was, I thought then, like Fabrice looking for the Battle of Waterloo – unsuccessful and disappointed. For reasons that we still cannot know for certain, Sartre did indeed remain constant in his fundamental pro-Zionism. Whether that was because he was afraid of seeming anti-semitic, or because he felt guilt about the Holocaust, or because he allowed himself no deep appreciation of the Palestinians as victims of and fighters against Israel’s injustice, or for some other reason, I shall never know. All I do know is that as a very old man he seemed pretty much the same as he had been when somewhat younger: a bitter disappointment to every (non-Algerian) Arab who admired him. Certainly Bertrand Russell was better than Sartre, and in his last years (though led on and, some would say, totally manipulated by my former Princeton classmate and one-time friend, Ralph Schoenman) actually took positions critical of Israel’s policies towards the Arabs. I guess we need to understand why great old men are liable to succumb either to the wiles of younger ones, or to the grip of an unmodifiable political belief. It’s a dispiriting thought, but it’s what happened to Sartre. With the exception of Algeria, the justice of the Arab cause simply could not make an impression on him, and whether it was entirely because of Israel or because of a basic lack of sympathy – cultural or perhaps religious – it’s impossible for me to say. In this he was quite unlike his friend and idol Jean Genet, who celebrated his strange passion for Palestinians in an extended sojourn with them and by writing the extraordinary ‘Quatre Heures à Sabra et Chatila’ and Le Captif amoureux.